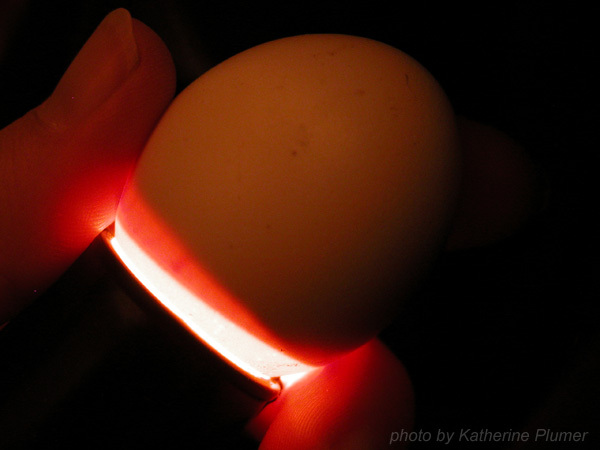 Hi Katherine, I have been enjoying the candling photos! I did something like that last year on my livejournal Blog... I only have 4 eggs in the incubator right now (all fertile). Production is slow to say the least. But I knew that going into the Sebrights. Found out that I was reading my wet bulb wrong, so that might explain my poor hatch rate withe sebrights, like you suggested. next egg is due to hatch this weekend.. keeping fingers crossed! Ugh, wet bulb! I always hated that thing, plus it was kind of stupid because you had to open the incubator to read it, and then that messed up the humidity anyway! I like to deal with humidity in terms of the actual percentage, rather than degrees wet bulb. So, here is my suggestion... Get a digital temperature/humidity sensor (it's a weather guage, they are pretty easy to find at stores, I got one at Target). Disregard the temperature, I've found those don't tend to be super accurate, but use it just as humidity sensor. You can leave it in there and read it through the door, or if you get the kind with a remote sensor you can put it anywhere you want! Even if it's off by a few %, it's MUCH easier to get a reading this way than with the wet bulb. And of course as you know you alter the humidity with the vent holes on the machine, and by covering (or uncovering the water pan for more or less surface area (I float chunks of styrofoam on it).